Purchase SPIDER-MAN: INTO THE SPIDER-VERSE on Ultra HD Blu-ray Today! Spider-Man: Into The Spider-Verse is officially out on Ultra HD Blu-ray, Blu-ray, DVD, and Digital HD. The film has already garnered high appraise including taking home an Oscar at this year’s Academy Awards. Personally I think it was hard toss up whether this or Incredibles 2 should have won best animated film. However this win was still well deserved. A film that has taken over the consciousness of much of America’s youth and I’m sure the world all over. Spider-Man: Into The Spider-Verse accomplishes many things that films whether animated or not seldom accomplish. Having heart, style, culture, pace and a story to go with it. The film is both culturally and ethnically diverse, and it does all of it in a blended subtle way that never sacrifices quality. Where it is unique, it’s also inclusive. Phil Lord and Christopher Miller are proving to be geniuses in their craft as a long with hit “The Lego Movie” they also brought us “Cloudy with a chance of Meatballs” which was also pretty big at it’s time and well received. All this has leaded up to the honing in on their brilliance and delivering us Spider-Man: Into the Spider-Verse. The future is bright not only for this duo, but for Miles Morales’ new found fame! I smell a live action block buster film right around the corner for young Miles. Spider-Man: Into The Spider-Verse comes to Ultra HD Blu-ray Disc 4k with HDR10 the basic equivalent of Dolby Vision without the fancy name. HDR10+ would have been a bit more it’s equal, but alas the picture quality on a great display still looks downright amazing. It’s no question why Spider-Man Into the Spider-verse won Best Animated Feature Film when the film’s blending of comic style and big budget animation screams of personality. The film utilizes perfect color palette for almost every scene and it looks stunning from this 4k disc and the blu-ray disc looks damn good to boot. 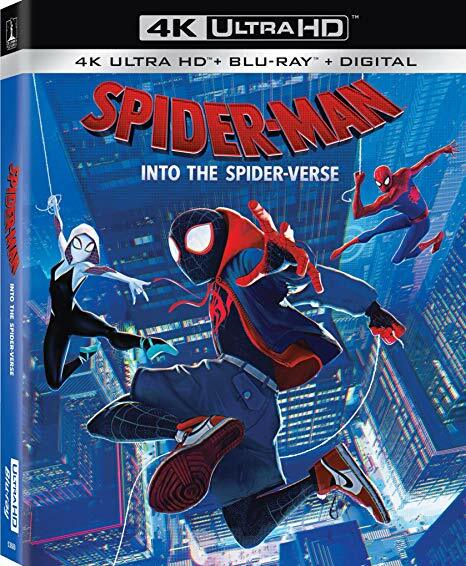 Spider-Man: Into The Spider-Verse comes to Ultra HD Blu-ray Disc 4k with a Dolby Atmos track (TrueHD 7.1 Compatible) that packs a literal punch. This film was made to impress stylistically in regards to the audio so it’s a must that we were treated with an audio track that could suit it well. And the Dolby Atmos track does just that with even the height speakers having a chance to show off. Whether we are getting punches from Kingpin, Miles traveling through the city, or Spider Gwen coming to the rescue the film has many places that allow for audio bliss. The soundtrack which is amazingly done to fit the style of this film is also one that just rocks your home theater. (or sound bar , etc whatever you may have). No complaints in the audio department.